Notes: Includes Medicaid spending for the buprenorphine prescription medications approved to treat OUD and Medicaid spending on naltrexone prescription medications approved to block the effects of opioids and naloxone prescriptions approved for the treatment of opioid overdose. 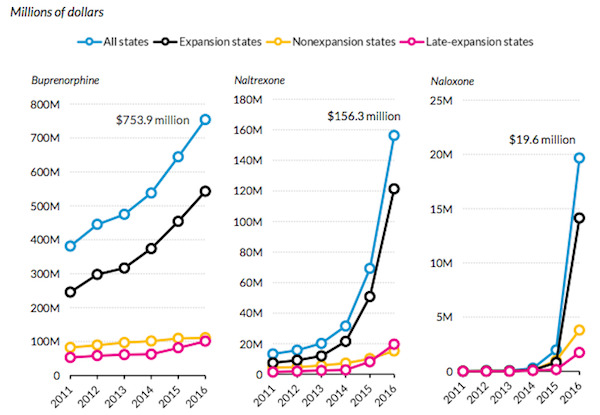 Data Source: Urban Institute analysis of State Drug Utilization data from the Centers for Medicare & Medicaid Services. This entry was posted in Data Watch on July 5, 2017 by Genevra Pittman.